CINCINNATI (January 23, 2018) – Back by popular demand, Cincinnati Zoo & Botanical Garden will continue “The Fiona Show” on Facebook Watch, bringing you live behind the scenes episodes with Fiona. Season 2 of the wildly popular show on Facebook Watch will kick off tomorrow, January 24, 2018, at 9:30 a.m. EST with a Live of Fiona celebrating her 1st birthday! Follow “The Fiona Show” on Facebook Watch to add the series to your Watchlist and be automatically notified when there is a new episode. Fiona’s birthday is a major milestone. She was born six weeks premature and weighed only 29 pounds, about half as much as the low end of the normal birth weight for a Nile hippo. Thanks to the Cincinnati Zoo’s animal care team, and a helping hand from Cincinnati Children’s, Fiona survived. “The fact that she’s alive today is a bit of a miracle,” said Gorsuch. 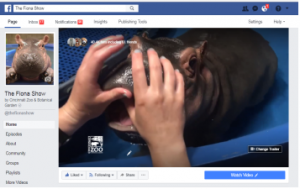 Another item to add to your “social” calendar on Fiona’s birthday is a special Instagram Live with San Diego Zoo keepers and their baby hippo Tony. Follow @cincinnatizoo on Instagram to see Tony and Fiona enjoying treats behind the scenes while keepers from @sandiegozoo share stories and compare developmental progress of the hippos in their care. The fun starts at noon EST on January 24. This is the first co-hosted Instagram Live for both Zoos. Witness history! « Happy First Birthday to Fiona!